Born on May 28, 1968 in Georgetown Guyana, Annand Ramdin, aka Victor, is an excellent poker player who now lives in The Bronx, NY. Victor has also spent time as a store owner and an investor in real estate. Victor Ramdin started playing poker in 2002 after watching some friends play the game in a bar. He caught on very quickly, and he made the money at the 2003 World Series of Poker in both the $2,000 Pot Limit Holdem event and the $10,000 Main Event, finishing 29th in the Main Event. In 2004, Victor Ramdin had a strong finish at the US Poker Championship and also made the money in the World Poker Tour Season 3 Championship. In 2005, Victor Ramdin made the final table of the Party Poker Million V Cruise, and in 2006 he had his biggest win yet, earning $1.3 million for his 1st place finish in the WPT Foxwoods Poker Classic. Two weeks after winning the Foxwoods Poker Classic, Victor Ramdin finished 11th in the WPT Season 4 Championship. Victor Ramdin also spends a lot of his time doing charitable work, helping out his native country of Guyana. He donates a lot of his winnings to pay for medical treatments for poor Guyanan children. 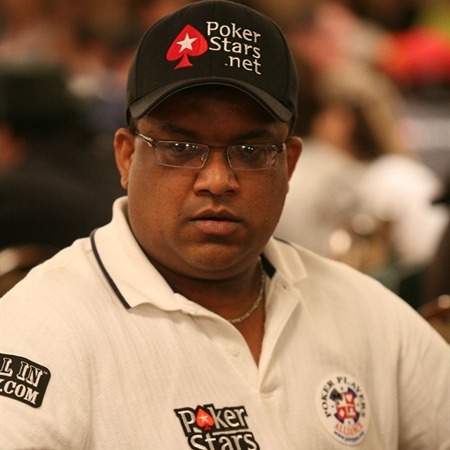 Victor Ramdin is a member of Team PokerStars, which is the PokerStars team of professional poker players.